The Quiet Baffle reduces exhaust sound level by 3-5 dB. Designed for use with the Big Shots Staggered Exhaust, Big Shots Long Exhaust, Big Shots Duals Exhaust, Straightshots Exhaust, Straightshots HS Slip-On Mufflers, Longshots HS Exhaust, Softail Duals Exhaust, Sideshots Exhaust, and Shortshots Staggered Exhaust. O.D. on Front: 1 5/8 in. and 2 in. O.D. on Back: 2 in. in. I.D. of Center Baffle: 1 1/2 in. Length: 9 3/8 in. in. I bought these baffles 2 weeks ago and put them in my Vance and Hines Short Shots Staggered in black last weekend. I had heard that the baffles would give you the increase in torque that was lost when installing the pipes w/out the quiet baffles. I can definitely say that it has done that. I feel much more throttle response and torque at the low end with these installed. The sound it gives is a nice low pitch rumble that the pipes themselves seemed to not have. Just the perfect sound for these pipes. Installation was easy. It took about 10 minutes per pipe. 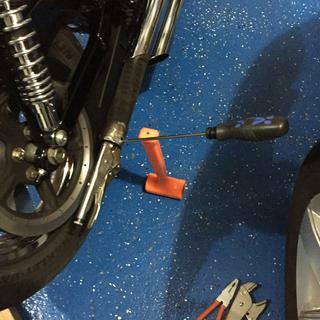 Two 1/2 inch nuts to pull the pipes, pull off the heat shield, and loosen one nut to remove the "stock" baffles. Put the new ones in and reverse those steps. Quick, easy, and definitely worth my money! I bought these with the idea that I could return them if they didn't do anything. We tried the shortshots without and with and can say I prefer it with them. The pipes are still loud but have a deeper tone to them. We also were able to keep some of the torque that would have been lost without them. Hint: if you order remember to order TWO. I missed that they are sold each not as a pair, so I had to rush ship a second one to have it for the weekend when I planned the install. My bad. Bought the Vance and Hines Short Shots and they were way too loud (I know: is there such a thing). Being right by my side they were extremely loud. The baffles only quieted them slightly and have a great deep rumble now. The only problem was I had to remove the pipes and heat shields to get to the bolts to remove the old baffles (if you can call them that) and install the new ones. It would have been much easier to purchase these with the pipes. Love em though and now my bike sounds like a bike! Checked the part number with Vance & Hines and they said that these baffles were not meant to fit my Straightshots exhaust system. Dennis Kirk had a detailed listing of this product that included both external and internal measurements of the part itself and fitment for various exhaust systems. Based on the details listed by Dennis Kirk, I determined that these baffles would indeed fit my Vance & Hines system . . . . . and they did, PERFECTLY. So much for the people at Vance & Hines knowing their own products. Thank You Dennis Kirk. These really mellowed out the tone of the shortshots. When you fire it up they dont seem any quieter but then you hear the pitch drop down a little. When you really notice it is when you are riding. The decel pop is really tamed and the edgy obnoxious sound is gone. That is what I like about these. The pipes are basically just as loud as before but a more tolerable sound now. As far as installation. Piece of cake. Once the heatshields were off it took about 5 minutes. The baffles arrived quickly and well packaged - the description was fairly accurate. I wanted to quiet down my Vance & Hines pipes and while they are quieter than what I had, it is not by much. They are quiet when idiling, but when accelerating they are still fairly loud. I wish there was some way with your web-site when purchasing items like this, that you could hear what they sound like before purchasing. This may not be easy to do but it would sure help. I will buy from you again !! These can definately be installed in short shots on an 883 low without removing the pipes. I had read they could not. Just remove the heat shields (easily done just unscrew the clamps and pull off) and you will have access to the retaining screws. They toned the pipes down quite a bit but they are still loud. They did make the bike run better adding a some low end torque. These baffles are fairly helpful. while they dont quieten that much they do deepen the sound and help eliminate most of the engine decel popping compared to standard baffles in the short shots. Quiet baffles was an easy fit. Removed one screw from each old baffle , pulled old baffle out with needle nose pliers . Slide new baffles in , installed screws. Started my bike up , still had the throaty Harley sound , but quiet enough to where my neighbors will not complain of the noise. Toke 30 min. to install. Good product, fair price, fast shipping. Easy install,remove old and slip these right in. Does lower the noise slightly and removes the high pitched tinny raspy sounds.Still is loud but better sounding lower tone. Worth the time and money. Ordered these after reading positive reviews and yes I would have to agree made my Fat Boy sound much better took away the harsh crackle and turned it into a rumble my wife even noticed the difference. This baffle fit great, toned down the noise. Great addition to the Short Shots, this still gives a roar but not air raid loud. Perfect tone I believe. Great product, zero instructions ! So glad that I bought these and they are avail!! Sounds sooo much better (1200 Harley-D). Original Vance short shots are too raspy for me. The new lower tone is ideal, loud enough but not so chainsaw'ish. No instructions led to hours of struggle for removal and replacement. Just a 1/2 page of 'how to' thrown in the package..... Lot of swearing & phone calls to get it done. these reduce the noise a little, not a lot, but more so, turn the raw, open header sound into a tuned sound that is actually pleasent to listen to. made it alot quitie and better siund. It reduce the sound greatly. Should be called "a little bit quieter baffle". It is an improvement over the straight through baffles that came with the exhaust. It took me about an hour to remove and replace the baffles. The exhaust pipe shields/guards have to be removed to get to the screws that hold the baffles. I used masking tape to hold the fiber material and twisted baffles to install, as suggested by others. They fit perfect. Performance of bike seems the same as before. I am glad I got them. Yea i didn't read all of it when it said sold in 1 each. So i had to order another and wait. but once installed bike sounds great with the vance & hines shorts. They eliminate most of the engine decel popping compared to standard baffles in the short shots. While they dont quieten that much they do deepen the sound. I purchased these to add some back pressure to the short shots, and try to eliminate some decel pop. The decel pop cut down a little. However, these did add some low end torque and improved throttle response by seat of the pants. It helps to tape the packing to the end of the baffle. Otherwise the packing will just bunch up while inserting the baffle. I'd read a couple of other reviews about these and was a tiny bit concerned about how easy (or not) they were going to be to fit into the pipes, what with reading about to packing material wanting to bunch up while sliding it into the pipe. It turns out it was a very simple fix per one reviewers idea to wrap very thin wire (I used fishing line with the idea it would eventually burn off and let the packing material 'fluff' back out inside the pipe) and wrap it around the material just enough to slide it into the pipe without it bunching. Worked like a charm and I had these installed in less than a half hour. As far as I'm concerned, they *DO* bring the noise down a bit, compared to what some others say that it barely does, but I agree with everyone else that these baffles also make the sound deeper. The bike really does sound better with these baffles than without. Overall I'd recommend them to anyone wanting or needing a little bit quieter or better sounding bike. Tone down the Straight Shots, a bit. The quiet baffles did just what I was hoping they would do. Straight Shots unplugged would be excessively loud for me. The baffles accomplished a more reasonable noise level and an excellent sound. Listed to fit Shortshots and Sideshots but also fit the Straight Shots. These baffles are the perfect compliment to your Vance and Hines Short Shots!! These are not really quiet, the take the rough edge off the sound, eliminate any popping on deceleration and give the bike a nice low rumble/tone. Your neighbors will love you for them! Easy to install just be sure to rotate them and you slide the in to keep the material wrapped around the baffle down. You will not be sorry you installed these. I lost no MPG with the pipes after outting these in, just the right amount of back pressure. I recently ordered the V&H quiet baffles for my xl1200c and I couldn't be more pleased. The SS that are on the bike sounded good but they were too loud and raw at certain RPMs. The quiet baffles mellowed out the tone and lowered the note a bit. They are still loud but not overwhelming now. The install went very well and only took about 1 hour from start to finish. The only problem that I ran into was the lack of tape around the wrapping on the baffle. That was easily fixed with some standard masking tape. Once I wrapped the front and back taped up it went it just fine. Overall this is a great product and I would definitely buy them again. I've gotten several compliments on the sound from my pipes with these in. Made a lot of difference! Bought a used Harley with no baffles, loud but did not sound that great. Ordered the quiet baffles and was worried they would be too quiet for my taste. Turns out they mellowed out the exhaust tone just right.. I purchased a 2009 H.D. Fatbob, the previous owner had installed Vance and Hines "Sideshots". I disliked the amount of noise, or "D-Cell" pop I experienced with every immediate deacceleration, or gear shift. I purchased these "Quiet Baffles" with some skeptisicism, but after installation, the pops disappeared, and the exhaust notes are MUCH better!! Shipping time was minimal. A VERY satisfying experience! Fairly easy to replace the stock baffles with the new Quiet Baffles by myself. And they did quiet the sound somewhat, not completely, which is good. Loud pipes save lives. These do a nice job of lowering the tone, giving them a nice meaty sound while taking away some of that drag pipe "bite". They are not quiet though, so don't be fooled by the name. It seems like they also give back some of the back pressure lost by installing a short 2-2 system. No regrets at all! bought these "quiet baffles" after true duels installed were rather loud and brash. They do tone it down a bit, a little less harsh, not a whole lot quieter, but better sound. true dual should have come with them originally, considering the $70 cost to improve the sound of new pipes. These baffles replaced the Vans & Hines screamers, and quieted down the noise to almost stock but throatier sound. I like the result. Good price, the better out there. I paid about $35 each plus shipping. The white material that provides the muffling is wrapped with some kind of plastic (like saran wrap). I removed it on one of the baffles because I thought I don't need this to melt inside the hot pipe. Big mistake. Leave it on! I did with the second one, and no problem. No smoke or smell. I WISH there were instructions from DK to leave wrap on. I've done 100 miles with these and they work great. love the easy of install.sound great and got rid of most my popping. The sound reduction is very low, it brings the short shots down from a roar to mild rumble. Don't know how long they will last but fit good. Could for the price be Quiter. Definitely makes a difference, but still loud rumble. Installation was easy but I did have to remove front slip-on heat shield and loosen mounting bracket to remove the straight baffle. This is on a 2007 Nightster with stock head pipes and V&H Straight Shop Slip-ons. I didn't run my 2011 Iron 883 without the baffles so I can't compare the before/after but they don't seem to do a lot to quiet the exhaust. A friend that has Big Radius pipes said they sound a little better (lower tone) than his, which makes me think the folks who suggest improved low end torque are probably right. I installed these on Shortshots along with the Vance & Hines V02 intake and Fuelpak. Torque across the spectrum does feel better and I don't have to wear earplugs to ride. Well done Vance & Hines and Dennis Kirk! This quiet baffle used on my straightshots slip ons was still too loud for my neighbors (95db at warm idle). I subsequently purchased the super quiet baffle, slightly too quiet at 91db warm idle. Between the two, I recommend the super quiet baffle DK# 44-9697. The fit was fine, but it was already starting to rust. It would have been better if it was made of stainless steel. Sound was not bad but really did little to quiet the bike. I bought two of these for my side shots , wanting to Quite them down enough so i could here my music and take a phone call while rolling down the road . But they come with a cap in one end. With the cap they are too quite and I loose too much power and there was way too much back pressure that when i turned my bike off it would continue to run but the motor would run backwards . So after Using a big drill bit 1"-1 1/2" wide , i drilled out the stupid cap and now they are perfect , just enough to quite the side shots down so i could hear my music and take a phone call or two. Now I still have the power and enough sound to still be heard and make heads turn and still hear the great sound that the side shots put out !! I'd just purchased a used 1999 FLCHCUI-Shriner equipt with the "true dual" system, the V&H Short Shots. The previous owner loved the system, but I absolutely hated the load and harsh noise. Even under light load, the stock Short Shots were deafening on a 25 mile commute, yet these were on a touring model. Before I offered to purchase the bike, I was already convinced to change the entire exhaust system. I purchased these baffles to tie me over for about a week. While the baffles installed easily and they did removed some of the bite as advertised, more performance was removed than noise. Not a good long-term solution. Long-term, I invested $1500 for the V&H Bagger Headers and the V&H Titan Oversized 450 mufflers and the V&H 450 Silent Baffles. (All in stock at Dennis Kirk) That $1500 system solution got me to where I needed to be for noise control and performance. There's no amount of baffling that can preserve performance and noise control in the small 2" diameter volume of the Short Shots that the 4-1/2" diameter volume of the 450's can deliver. These Short Shot baffles are adequate for a short-term solution, as long as one realizes that "quiet" is not mechanically possible in the small volumes of the Short Shots. Will the V&H quite baffles that fit shortshots fit straightshots ? BEST ANSWER: Yes. By straightshots you must mean sideshots. I installed these baffles in my V&H sideshots and they fit perfectly. Don't hesitate buying them, they make a very noticeable difference.! These will fit Straight Shots. I recently installed these in my Straight Shots on my FXDL and wow what a difference. Yes. No problem. I've done it. Suggest anti-seize when you put them in the other pipes. Ride safe! Will the engine be silant? BEST ANSWER: The quiet baffles for the Vance & Hines short shots wil only reduce the exhaust noise by a couple of decibels. You will still get the exhaust rumble but just a tat bit lower. Short answer is no it will not silence the exhaust noise. I'm not sure what you're referring to silent engine, the exhaust noise difference was hardly noticeable, but the baffles did seem to provide some backpressure, so the engine didn't search for a fuel mixture quite as much. No, not at all, quiet isn't quite the right word, they are quieter than standard baffles, and have a better tone, but still plenty high on the decibel meter. No but they do sound great and not as loud as straight thru pipes I know because I took out my straight thru pipes for baffles and Iam glad I did. Although the baffles do make a definite difference as compared to no baffles, it is still much louder than the stock muffler system. they are louder than stock pipes. Gives the bike a great sound, easier to live with the neighbors. No. Quiet baffles will tone the sound down by a few decibels, but will not make the pipes silent. No The engine won't be silent you will hear it through the exhaust tone. NO,quieter than original V&H baffles they don't cackle like drag pipes. Nope, nice rumble. not silent at all really just good tone. Enjoy! Short answer no. But sounds awesome. Will these fit my 2006 883R short shots? I believe they fit all V&H short shot staggered. Took the high freq popping off my sound - good sound now, don't feel as obnoxiously loud. DK lowest price and shipping was FAST. Didn't come with instructions but plenty of online info and simple job, worst part is removing covers. Hard to say.. It all depends on the kind of pipes you are running. I installed these on my Vance n Hines short shots staggered and they fit like a globe.. I was aiming for a quieter pipe .. now I'm switching to bassani 2into 1 .. nothing to do with the baffles ..
Not sure about your bike I went with the measurements of the diameter of my pipes and the spec measurements that were given by Dennis Kirk, the measurements were the same and they fit perfectly. Yes I believe they fit all short shots. I have a 99 sportster and I'm very happy with them. I hope this helps. Yes - They are cut for the Vance & Hines Shortshot exhaust. If you look at the Fitment chart your 883R is the 4th one down on the list. These should fit short shots for any model. They definately fit short shot pipes because that is what I have and these baffles fit great. I know they fit any short shot . Will these fit screaming eagle II muffler's? BEST ANSWER: I called the manufacturer and had a talk with one of the guys there and he gave me the info I was seeking for my application. I suggest you call the manufacturer and ask your question...I think I found their contact data by doing a Google search on their company name, which I now forget..I don't have screaming eagle pipes. I have V&H Shortshots. FWIW I see no difference in noise after installation in mine. I would have to say no they won't.., these quite baffles are made specially for the V&H short shots. You would have to shop Harley baffles for you Sceaming Eagles. Good luck! Will these fit python staggered duels? Will these fit my short shots on my 2006 883R? I installed them in Python staggered duals, so I do not know. The OD of the baffles is 2". Will tuning be required due to the increase in back pressure? BEST ANSWER: That is difficult to answer not knowing what exhaust is currently is on the motorcycle, but to maximize performance the engine should be tuned to the exhaust. I did not re-tune to my carbureted Fat Boy because this baffle was only slightly quieter than the previous baffle it replaced and have had no problems. I haven't had any problems with the original tune for the short shots without the quiet baffle after installing the quiet baffle. These quiet baffles aren't quiet, they only reduce the sound a little. But is does give the exhaust a deeper sound. No tuning required...be sure to secure the fiberglas onto the quiet baffle with wire wrapped tightly aroudn the baffle in four places, otherwise the fiberglass will bunch up and be ineffective. Not if your bike was set up for the standard louder baffles.My Dyna ran better with less popping on decel. Will these fit my 2006 873R short shots? They will. They are just the right amount of quite. The pipes are 2 inches at the end and so I guess 1.7/8 inches for the baffles. Length not a concern - I'm trying to get 'less loud" and hopefully more torque. Thanks. Probably not, there made specifically for Vance and Hines Short shot pipes. I installed gp shorty pipes on my 01 Ninja 500R....way to loud. Will these fit In the pipe before the gp shorty? BEST ANSWER: Doubt it! These are designed to fit in the exhaust ends that are 2 1/4". I believe your exhaust pipes are much narrower diameter. If you measure them withamicrometer on the outside you will be very close to the inside diameter. You may add a short straight pipe baffle in your pipes before the shorty. They come in 4" and longer like12" I believe. But you will have to drill your pies and install stainless screws and a locknut to keep the baffle stable. These do take the bark out of loud pipes. The longer they are the more they reduce the noise level. Hope this helps you. Have a great day! This baffle is suitable for v&h 2-into-1 exhaust?